Saturday Night Live is at it again. The famous 2008 primetime presidential election spoof is back, this time taking a jab at the upcoming 2012 race. NBC entertainment chairman, Bob Greenblatt, recently announced that SNL is to air two primetime election specials this fall. The announcement was made at last Tuesday's Television Critics Association summer press tour. The election specials are expected to be a huge ratings boost for the network, but will they be as successful as the last go-around? 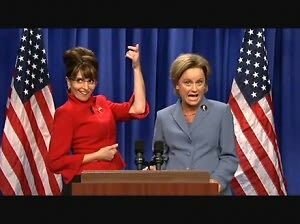 Tina Fey, who earned an Emmy nod for her hilarious portrayal as Veep candidate Sarah Palin, and other cast members who were almost too realistic (Darrell Hammond as John McCain and Amy Poehler as Hillary Clinton) are no longer on the show. Further more, the rumors are flying as to whether Jason Sudeikis will reprise his role as GOP nominee Mitt Romney and remain on the SNL cast for the upcoming fall season. Tune in on September 20th and 27th and you be the judge.